Fragile, devitalized hair, and brittle nails? 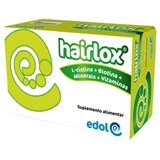 To maintain an healthy hair and nails, Hairlox is the ideal solution. A food supplement that combines in its formulation, the quantities needed for beneficial and and revitalizing results. Hairlox - the strengthening care that your hair and nails need so much!